Identification: Witte and Schmidt (1992) discussed the genus and provided an identification key to species. They treated B. splendens as a valid species, but also recognized a B. splendens species complex. Many color variants have been developed by aquarists. See Axelrod et al. (1985) for color photographs of live fish. Native Range: Tropical Asia. Native to Southeast Asia including the northern Malay Peninsula, central and eastern Thailand, Kampuchea, and southern Vietnam (Witte and Schmidt 1992). Nonindigenous Occurrences: Specimens ranging from 1-3 cm were taken from the Thames River drainage in Connecticut (Whitworth 1996). Specimens were collected from Lake Worth Drainage District canal L-15, adjacent to an aquarium fish farm west of Atlantis in Palm Beach County, Florida (Ogilvie 1969; Courtenay et al. 1974), but have not been found at that locality in subsequent years (Courtenay and Hensley 1979). A population became established in a canal south of Holmberg Road in Parkland, northern Broward County. When first discovered in December 1975, it was a dominant fish; however, the population was killed by extremely cold weather in January 1977 (Courtenay and Hensley 1979; Courtenay et al. 1984; Courtenay and Stauffer 1990). A single specimen was collected in the headwaters of Gamble Creek, near Parrish (UF 118475). Table 1. States with nonindigenous occurrences, the earliest and latest observations in each state, and the tally and names of HUCs with observations†. Names and dates are hyperlinked to their relevant specimen records. The list of references for all nonindigenous occurrences of Betta splendens are found here. Means of Introduction: Florida records are the result of probable escapes from local ornamental fish farms (Courtenay and Stauffer 1990). Connecticut records are probably aquarium releases. Status: Failed in Connecticut. Shafland et al. (2008b) list it as a formerly reproducing species based on a recent survey (Shafland et al. 2008a). Remarks: A supposed report of Betta splendens in Hiko Spring, Lincoln County, Nevada, was false (W. Courtenay, personal communication). This species has been shown to be an alternative host to the glochidia of native unionid mussels Lampsilis cardium and Utterbackia imbecillis (Watters and O'Dee 1998). 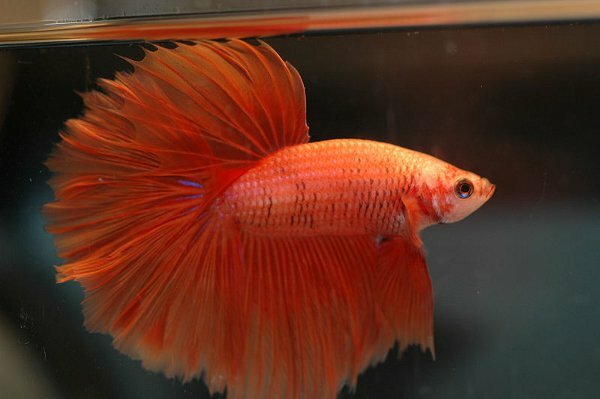 Siamese fighting fish are widely used in studies of animal behavior. Voucher specimens: Florida (UF 97046, 118475). Axelrod, H. R., W. E. Burgess, N. Pronek, and J. G. Walls. 1985. Dr. Axelrod's atlas of freshwater aquarium fishes. Tropical Fish Hobbyist Publications, Inc., Neptune City, NJ. Courtenay, W. R., Jr., and D. A. Hensley. 1979. Survey of introduced non-native fishes. Phase I Report. Introduced exotic fishes in North America: status 1979. Report Submitted to National Fishery Research Laboratory, U.S. Fish and Wildlife Service, Gainesville, FL. Courtenay, W. R., Jr., and J. R. Stauffer, Jr.. 1990. The introduced fish problem and the aquarium fish industry. Journal of the World Aquaculture Society 21(3):145-159. Courtenay, W. R., Jr., H. F. Sahlman, W. W. Miley, II, and D. J. Herrema. 1974. Exotic fishes in fresh and brackish waters of Florida. Biological Conservation 6(4):292-302. Ogilvie, V. E. 1969. Illustrated checklist of fishes collected from the L-15 Canal (Lake Worth Drainage District) in Palm Beach County, Florida (collection date November 8, 1969). Unpublished Report for the Florida Game and Fresh Water Fish Commission. 10 pp. Shafland, P.L., K.B. Gestring, and M.S. Sanford. 2008a. Florida's exotic freshwater fishes - 2007. Florida Scientist 71: 220-245. Shafland, P.L., K.B. Gestring, and M.S. Sanford. 2008b. Categorizing introduced fishes collected from public waters. Southeastern Naturalist 7(4): 627-636. Watters, T.G. and S.H. O'Dee. 1998. Metamorphosis of freshwater mussel glochidia (Bivalvia: Unionidae) on amphibians and exotic fishes. American Midland Naturalist 139: 49-57. Witte, K. E., and J. Schmidt. 1992. Betta brownorum, a new species of anabantoid (Teleostei: Belontiidae) from northwestern Borneo, with a key to the genus. Ichthyological Exploration of Freshwaters 2(4):305-330.